Of attractive proportions, with a very sea-worthy hull, and plenty of living space, the Swift Trawler 34 is designed for the ocean and life at anchor. 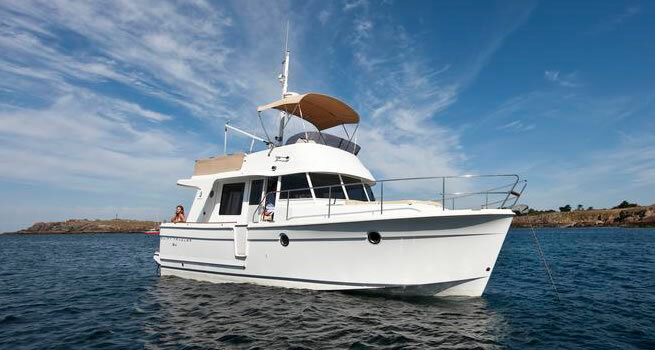 Its size and clever features make the Swift Trawler 34 very easy to handle, solo or as a couple. It truly redefines experiencing the sea and voyaging. The Swift Trawler 34 inherits its overall visual appeal from its 42-foot big brother, with a stylish wheelhouse and large flybridge, complete with derrick for easy tender handling and stowage. The capacious cockpit locker is big enough to store every item of seagoing equipment. A hinged gate provides access to the transom skirt and its bathing ladder. Access to the generous sunbathing platform forward of the wheelhouse is either via the starboard passageway (with its safety door) or the wide and ultra-safe side deck to port. The flying bridge is surprisingly spacious and extremely comfortable. 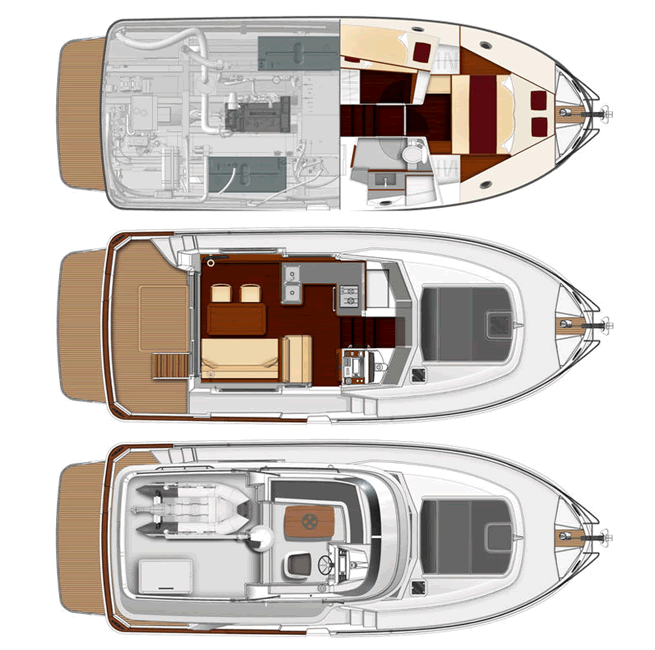 To port, a large space is available to house the tender, whilst further forward is the starboard helm position and saloon with a 6-seater table. The saloon converts very easily to provide a double berth to starboard (with a clic-clac sofa bed opening to 1.20 x 2.00 metres). Moving forward, the port side helm station with its double bench seat is extremely comfortable. The removable floor step is retractable for easy access to the passageway via a sliding side door. The U-shaped galley with its double sink and choice of work surfaces is to port. The companionway leads to the port guest cabin (with bunk berths) and the starboard washroom and WC with its ventilation port and storage. The bow compartment houses the generous owner’s cabin with its large bed (1.99 x 1.60 metres with access from both sides) and many storage spaces (including one beneath the bed). A great deal of work has been done to maximise the acoustic insulation on board. Lastly, the Swift Trawler 34 is extremely roomy, with a saloon, galley and owner’s cabin comparable in size to the accommodation offered in the 42-foot version; in fact, the finishes and woodwork are identical. The Swift Trawler 34 is powered by a single Cummins 425 HP diesel delivering a maximum speed of 22 knots for real safety and performance at lower fuel consumption. The hull is immensely stable when moored and underway, and berthing manoeuvrability is maximised by the bow thruster (standard) and stern thruster (optional). Clear access to the engine, plumbing and electrical systems makes for easy maintenance and servicing.